Surprise! Just when you thought it wasn’t going to get written! 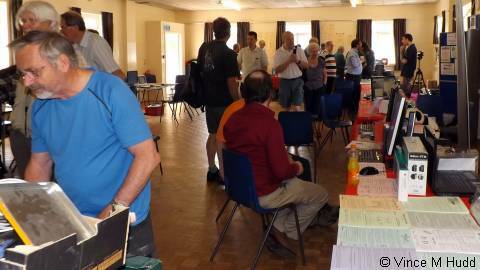 The 2014 Midlands Midsummer MUG Show took place on 12th July, at the St John’s Church Hall in Kenilworth, just as it has for the last few years, and I was there, rapidly changing hats so fast no observer could even see me doing it (or even see the hats), between one for Soft Rock Software, and one for RISCOSitory – on the one hand, promoting my products (both old and new), and on the other promoting this site, and gathering information for it. Around this point, a trusty coin usually decides which direction the report should take around the hall, and that coin has suggested anti-clockwise. However, that direction means I’ll be ending on one of the smaller exhibitors, which may be less exciting than the more well known, larger exhibitors, so I’m going to make an executive decision and follow the coin, but not start at the main entrance! 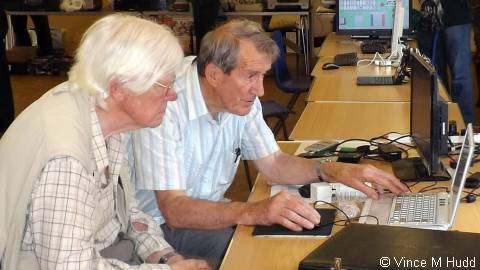 If a visitor decided to sneak in via the door at the corner, used by most of the exhibitors when they set up, their first anti-clockwise encounter would have been Robin Edwards demonstrating some Serious Statistical Software. 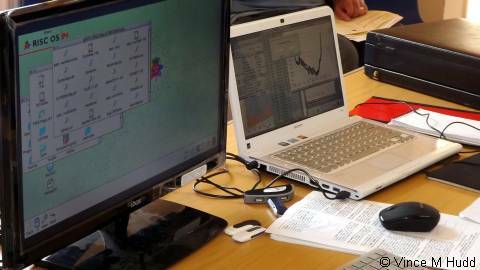 Robin has, for some years now, been using his software to analyse climate-related data, and will happily chat to people about his findings, which he insists point to the conclusion that there’s nothing to worry about – the events depicted in films like The Day After Tomorrow and 2012, which are supposedly the result of climate-change caused by the pesky human race, definitely aren’t going to happen the day after tomorrow or, erm, in 2012. Phew – that’s a relief to everyone, I’m sure! After Robin, Stephen Unwin was playing a neat game of patience, based on one he was taught to play in his youth, and which he has dubbed Montana Patience – though he didn’t seem entirely sure that’s its real name. After Stephen was… FOOD and DRINK from the hatch in the corner! Yay! Of which I didn’t actually partake this year. Boo! 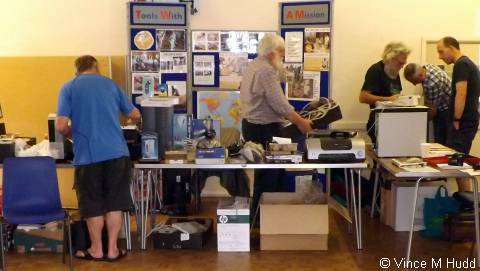 Then came the charity stand, supporting Tools with a Mission, from which all manner of old books, software and hardware was available, and to which old tools could be donated. Tools with a Mission collects and refurbishes tools and equipment that are surplus to people’s requirements, then sends it abroad, to places where such things are needed and can serve a useful purpose. 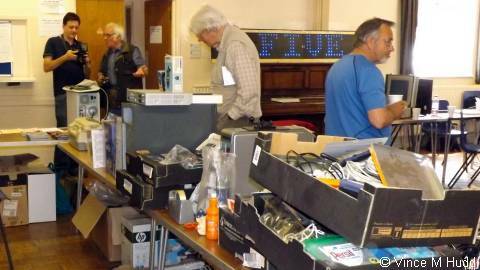 Unfortunately, although I have asked, I don’t know how much money was raised by RISC OS users at this show. One of the usual larger exhibitors was next, in the form of R-Comp. 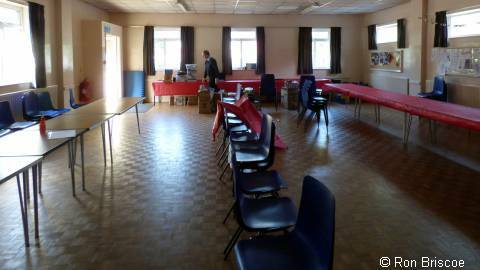 As usual, there was a wide selection of software and hardware to be had, and this year saw Andrew Rawnsley introduce a new piece of software in the form of DeleGate. Andrew gave one of the show’s two presentations, during which he spent a little time talking about the ARMiniX, demonstrating its speed by having one render multiple copies of the famous Artworks apple which would have taken some time to complete on older hardware, but is done in the blink of an eye on ARMiniX. 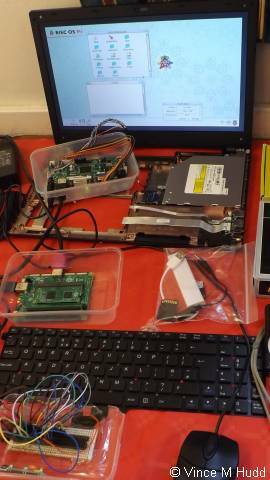 From there he moved onto the upgrade system R-Comp has in place for RISC OS on the system, explaining just how easy it is, and how it’s possible to use the upgrade software – developed in house – to downgrade again if necessary. 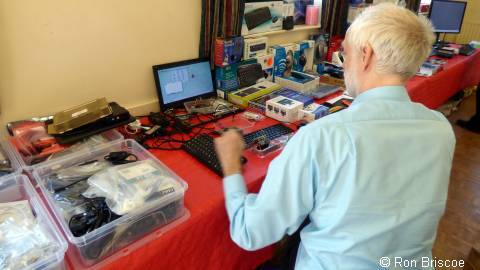 He also then spoke briefly about !Store, explaining its importance with a platform like the Raspberry Pi running RISC OS. 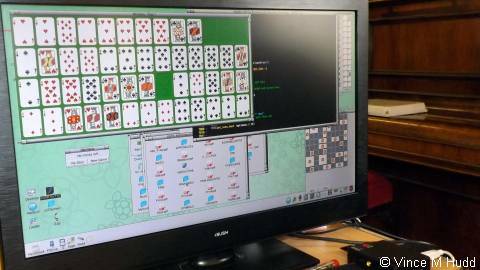 Since, while we regular RISC OS users generally know where to turn to find software when we need it, new users of the platform – who might be trying it out because of the Pi – don’t have that knowledge. By having !Store on the default disc image for the Pi, as well as other new platforms, new users are presented with an easy way to find software – somewhere to start. And from !Store, Andrew then moved swiftly onto DeleGate, which formed the main part of his presentation. To put it very simply, DeleGate is the latest ‘Recycle-Bin’-type product for RISC OS and, when installed, will trap deletes, sending the object of the deletion winging its way into DeleGate’s cache. Andrew explained that its origins lay in a piece of software called BootGuard, which he includes with the modern ARM-based platforms supplied by the company to provide some protection for the system/boot-loader files, and wants DeleGate to become the last word in delete protection, outlining some of the plans he has for the software. 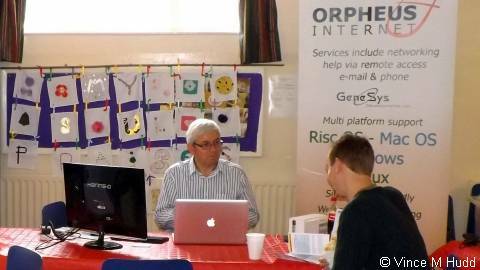 Forming the other half of the dynamic duo (because they teamed up to save Gotham City the South West Show a few short years ago), Richard Brown was next, representing Orpheus Internet, the RISC OS-friendly ISP who are also happy to support other operating systems – well, someone has to! Richard was letting the side down this time by not bringing along his customary bowl of sweets – but, luckily, the chap on the next stand was celebrating something, so he had sweets available. The chap on the next stand? That was me, of course, and the celebratory sweets were because 2014 marks the twenty fifth birthday of Soft Rock Software – the ‘official’ date being just twelve days before the show, on 30th June. And with 2014 also marking the 20th birthday of the RiscPC, which was celebrated at Wakefield earlier in the year, what better time could there be to introduce a new product? That product is a RISC OS-flavoured case for the Raspberry Pi called the RiscPiC, which pays homage to Acorn’s most powerful computer in its appearance, and comes in two versions – the standard RiscPiC, and the RiscPiC-mini, with the first proptotype of each being on display. The first of these has the more obvious RiscPC look, despite being Raspberry Pi-sized, and is wide enough that adaptors can be attached to the Pi to bring most of the connections on its left and right sides out of the rear (an adaptor will be included for the HDMI and headphone sockets). 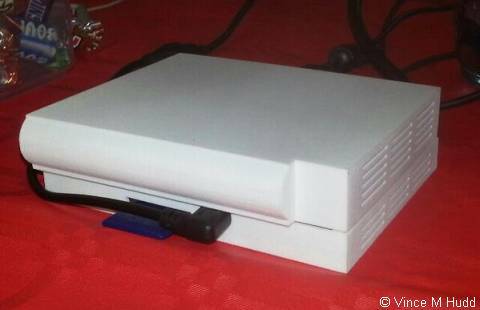 The RiscPiC-mini, however, is about the same size as most other Raspberry Pi cases, so all of the connections are exposed in place, but it still retains something of the RiscPC’s appearance. 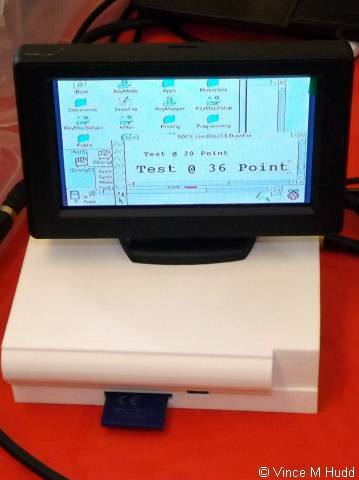 The RiscPiC and RiscPiC-mini should – hopefully – be on sale at the London Show, on 25th October. Additional slices are also planned, to allow the case to be expanded along with the Pi, but they won’t appear until 2015. 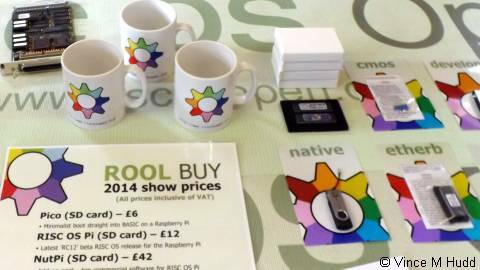 The penultimate exhibitor was RISC OS Open Ltd, represented by Rob ‘Sprow’ Sprowson, who had on sale a wide selection of ROOL’s product range, including RISC OS Pi and Nut Pi SD cards, the ’emulate’, ‘native’ and ‘develop’ USB sticks, and RISC OS 5.20 on ROM for RiscPC, A7000 and A7000+. There were two items in particular that I wanted to buy, but somehow managed to forget: Pico, an SD-card for the Raspberry Pi that will boot it straight into BBC BASIC (think BBC computer, and the fact that another anniversary being celebrated in 2014 is that BASIC – though not BBC BASIC specifically – is now fifty years old), and the ROOL mugs, which have had a design refresh, and now sport the ROOL website address underneath the ROOL multi-coloured version of the RISC OS cog. The final exhibitor was CJE Micro’s who had, as ever, brought along a seemingly impossible amount of stock considering the size of their car. Chris Evans gave the only other presentation of the show, and after a minute talking about their flagship system – the PandaRO – he moved onto the Raspberry Pi Compute Module which, he explained, opens up possibilities for different form factors that will run RISC OS, and by way of an example, talked about one that would be smaller (and therefore more limited) than a Raspberry Pi, but which could conceivably be plugged straight into a Motorola Atrix Lapdock, or attached to the back of a TV for use as a media centre. One area Chris is particularly keen on is the possibility of producing a RISC OS laptop, with the Pi Compute module at its heart. 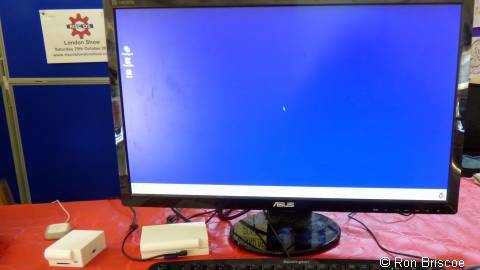 To this end, he’d brought along a proof of concept – a Compute module (in a plastic tub) talking to a laptop’s display using an off-the-shelf HDMI to LVDS board. That was the easy part. 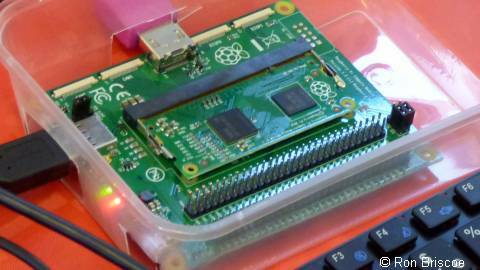 The harder task, it seems, is getting the keyboard and trackpad from a laptop talking to the Pi under RISC OS – with the most likely solution being to use a microcontroller – essentially, a very simple computer on a single chip, which could be programmed to read the keyboard and trackpad, and send the resulting data to the main system over USB. Should Chris’ plans for a laptop come to fruition, he does plan to offer the option of an optical drive, but feels that the space on the side of the case where the optical drive would normally be accessed would be ideal to bring the GPIO lines out from the Pi to the outside world, which would have more appeal to the bigger Raspberry Pi DIY/hacker market. And for even more appeal to that market, another possibility is to produce something suitable for people to take their own, old laptops, take out the motherboard, and install CJE’s Pi Compute-based system in its place. The talk finished with Chris talking about the possible price of a RISC OS laptop, joking that someone suggested it should cost less than an Acorn A4 and assuring everyone that it would, because the A4 originally cost £1,995! The final product will certainly be pricey compared to many off the shelf laptops, however, simply because of the costs involved in producing it – the machine used for the proof of concept, for example, was purchased without a processor, drives and operating system, but still had a motherboard, which was taken out because it wasn’t needed; Chris did approach his supplier to ask if they could provide it without even the motherboard, which would have reduced the cost a touch, but they weren’t interested in doing so. And, after visiting the CJE stand, the would-be visitor who sneaked into the show via the wrong entrance would once again be at that entrance, which could now serve as a sneaky exit. That was the Midlands Show, 2014. 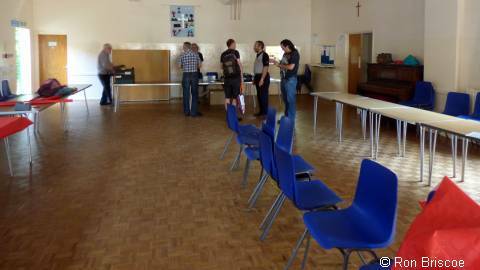 Sadly, the Midlands User Group have decided that this will be the last Midlands Show, since – once again – the visitor numbers were only marginal. Although I don’t have the exact number I gather that, like last year, the total number was only in the twenties. As a result, the group made a loss on the show, which members therefore had to make up. Member Stuart Winsor expressed his disappointment at this in a post to Archive-online, saying “What we find irritating is that many of us travel to Wakefield, London, and the Southwest [minor correction! ], to support their shows, but they can’t be bothered to come and support us” – and he does have a fair point. 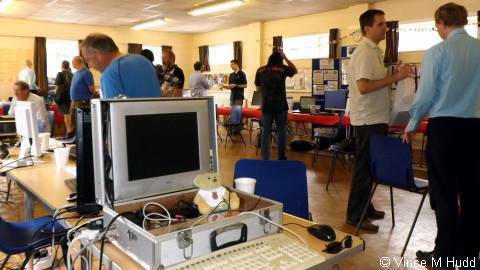 As I commented last year, when the show had such a disappointing turn-out, all of the RISC OS shows – including small ones like this – serve a useful purpose to the RISC OS community, by providing developers and companies with the opportunity to talk face to face with customers, existing and potential, to discuss ideas and requirements, and so on. And now it appears there will be one less in the RISC OS calendar for 2015 – very much a case of “use it or lose it” leading to it being lost. Not so lonely anymore. Well, at the other end of the hall, anyway! From behind the charity stand, supporting Tools with a Mission. Climate change? It’s a storm in a teacup! The RiscPiC again, sneakily put on CJE’s table for a fun photo op!